The NewsLine: World of Film crew. Film crew and equipment on a location shoot. A film crew is a group of people hired by a production company for the purpose of producing a film or motion picture. Crew are distinguished from cast, the actors who appear in front of the camera or provide voices for characters in the film. Crew are also separate from producers, those who own a portion of either the film company or the film's intellectual property rights. A film crew is divided into different sectors, each of which specializes in a specific aspect of the production. “Production” is generally not considered a department as such, but rather as a series of functional groups. These include the "front office" staff such as the Production Manager, the Production Coordinator, and their assistants; the accounting staff; the various Assistant Directors; and sometimes the Locations Manager and their assistants. The Director is considered to be a separate entity, not within the departmental structure. A film producer creates the conditions for making movies. The producer initiates, coordinates, supervises, and controls matters such as raising funding, hiring key personnel, and arranging for distributors. The producer is involved throughout all phases of the film making process from development to completion of a project. An executive producer is usually an investor in the project or just a credit that the filmmaker gave to someone who paid for the credit. There may be multiple executive producers on a project, depending on the financing arrangements. The production manager supervises the physical aspects of the production (not the creative aspects) including personnel, technology, budget, and scheduling. It is the production manager's responsibility to make sure the filming stays on schedule and within its budget. The PM also helps manage the day-to-day budget by managing operating costs such as salaries, production costs, and everyday equipment rental costs. The PM often works under the supervision of a line producer and directly supervises the Production Coordinator. The unit manager fulfills the same role as the production manager but for secondary "unit" shooting. In some functional structures, the unit manager subsumes the role of the Transport Coordinator. The Production Coordinator is the information nexus of the production, responsible for organizing all the logistics from hiring crew, renting equipment, and booking talent. The PC is an integral part of film production. Post Production Supervisors are responsible for the post production process, during which they maintain clarity of information and good channels of communication between the Producer, Editor, Supervising Sound Editor, the Facilities Companies (such as film labs, CGI studios and negative cutters) and the Production Accountant. Although this is not a creative role, it is pivotal in ensuring that the film's Post Production budget is manageable and achievable, and that all deadlines are met. Because large amounts of money are involved, and most of a film's budget is spent during Production, the Post Production period can often be difficult and challenging. The director is responsible for overseeing the creative aspects of a film, including controlling the content and flow of the film's plot, directing the performances of actors, organizing and selecting the locations in which the film will be shot, and managing technical details such as the positioning of cameras, the use of lighting, and the timing and content of the film's soundtrack. Though the director wields a great deal of power, they are ultimately subordinate to the film's producer or producers. Some directors, especially more established ones, take on many of the roles of a producer, and the distinction between the two roles is sometimes blurred. The first assistant director (1st AD) assists the production manager and director. The ultimate aim of any 1st AD is to ensure the film comes in on schedule while maintaining a working environment in which the director, principal artists (actors) and crew can be focused on their work. They oversee day-to-day management of the cast and crew scheduling, equipment, script, and set. A 1st AD may also be responsible for directing background action for major shots or the entirety of relatively minor shots, at the director's discretion. The second assistant director (2nd AD) is the chief assistant of the 1st AD and helps carry out those tasks delegated to the 1st AD. The 2nd AD may also direct background action and extras in addition to helping the 1st AD with scheduling, booking, etc. The 2nd AD is responsible for creating Call Sheets that let the crew know the schedule and important details about the shooting day. In Canadian and British functional structures there are 3rd ADs and even Trainee ADs; in the American system there are 2nd 2nd ADs. A production assistant assists the first assistant director with set operations. Production assistants, almost always referred to as PAs, also assist in the production office with general tasks. Also known as the "continuity person", the script supervisor keeps track of what parts of the script have been filmed and makes notes of any deviations between what was actually filmed and what appeared in the script. They make notes on every shot, and keep track of props, blocking, and other details to ensure continuity from shot to shot and scene to scene. The Script Supervisor's notes are given to the Editor to expedite the editing process. The script supervisor works very closely with the director on set. Where the film requires a stunt, and involves the use of stunt performers, the stunt coordinator will arrange the casting and performance of the stunt, working closely with the director. Chooses the actors for the characters of the film by inviting the actors to a practice for the script called an audition. The art department in a major feature film can often number hundreds of people. Usually it is considered to include several sub-departments: the art department proper, with its art director, set designers and draughtsmen; set decoration, under the set decorator; props, under the propmaster; construction, headed by the construction coordinator; scenic, headed by the key scenic artist; and special effects. Also known as the creative director, the production designer is responsible for creating the physical, visual appearance of the film - settings, costumes, character makeup, all taken as a unit. The production designer works closely with the director and the cinematographer to achieve the 'look' of the film. Within the overall Art Department is a sub-department, called the Art Department, which can be confusing. This consists of the people who design the sets and create the graphic art. The art director reports to the production designer, and more directly oversees artists and craftspeople, such as the set designers, graphic artists, and illustrators who give form to the production design as it develops. The art director works closely with the construction coordinator to oversee the aesthetic and textural details of sets as they are realized. The first, second and third assistant art directors carry out the instructions of the art director. Their work often involves measuring locations, creating graphics and paper props, collecting information for the production designer and drawing sets. Sometimes a set designer is also the first assistant art director. In this capacity, they manage the work flow and act as the 'foreman' of the drawing office. The illustrator illustrates visual representations of the designs to communicate the ideas imagined by the production designer. The set decorator is in charge of the decorating of a film set, which includes the furnishings and all the other objects that will be seen in the film. They work closely with the production designer and coordinates with the art director. In recognition of the set decorator's importance, the Academy Award for Art Direction is given jointly to both the production designer and the set decorator. The buyer is the number two person in the set department below the set decorator. The buyer locates, and then purchases or rents the set dressing. The lead man is the foreman of the sets crew, often referred to as the “swing gang”. Also assists the set decorator. The set dressers apply and remove the "dressing", i.e., furniture, drapery, carpets—everything one would find in a location, even doorknobs and wall sockets. Most of the swing gang's work occurs before and after the shooting crew arrives but one set dresser remains with the shooting crew and is known as the on-set dresser. In some countries, such as Great Britain and the Republic of Ireland, the set dressing department is referred to as dressing props department. The property master, more commonly known as the props master, is in charge of finding and managing all the props that appear in the film. The propsmaster usually has several assistants. The props builder, or more frequently propmaker, as the name implies, builds the props that are used for the film. Props builders are often technicians skilled in construction, plastics casting, machining, and electronics. The armourer is a specialized props technician who deals with firearms. In most jurisdictions this requires special training and licenses. The construction coordinator oversees the construction of all the sets. The coordinator orders materials, schedules the work, and supervises the often sizeable construction crew of carpenters, painters and labourers. In some jurisdictions the construction coordinator is called the construction manager. The head carpenter is the foreman of a "gang" of carpenters and laborers. The key scenic artist is responsible for the surface treatments of the sets. This includes special paint treatments such as aging and gilding, as well as simulating the appearance of wood, stone, brick, metal, stained glass--anything called for by the production designer. The key scenic artist supervises the crew of painters, and is often a master craftsperson. In the UK, the above responsibilities would normally be those of the head painter; the scenic artist is responsible for producing artist painted backings. The greensman is a specialised set dresser dealing with the artistic arrangement or landscape design of plant material, sometimes real and sometimes artificial, and usually a combination of both. Depending on the scope of the greens work in a film, the greensman may report to the art director or may report directly to the production designer. If a significant amount of greens work is required in a film, then the Greens may be an identifiable sub-department, with its own team - often of a size numbering double figures - and hierarchy (eg. Greensmaster, Greens Supervisor, Foreperson, Leading Hand, Laborers). Specialists from other areas of the Art Dept. (eg. Fabricators, Sculptors, Painters/Scenics) may also be drafted to work exclusively on Greens. This department oversees the mechanical effects—also called practical or physical effects—that create optical illusions during live-action shooting. It is not to be confused with the visual effects department, which adds photographic effects during filming to be altered later during post-production video editing. The special effects supervisor instructs the special effects crew on how to design moving set elements and props that will break, explode, burn, collapse and implode without destroying the film set. S/he is also responsible for reproducing weather conditions and other on-camera "magic." The SFX assistants carry out the instructions of the special effects supervisor, building set pieces like breakaway furniture and cities in miniature, lighting pyrotechnics, and setting up rigging equipment for stunts. They also assist in prosthetic makeup. Some actors or actresses have personal makeup artists or hair stylists. Make-up artists work with makeup, hair and special effects to create the characters look for anyone appearing on screen. Their role is to manipulate an actor's on-screen appearance whether it makes them look more youthful, larger, older, or in some cases monstrous. There are also body makeup artists who concentrate their abilities on the body rather than the head. The costume designer is responsible for all the clothing and costumes worn by all the actors that appear on screen. They are also responsible for designing, planning, and organizing the construction of the garments down to the fabric, colors, and sizes. The costume designer works closely with the director to understand and interpret "character", and counsels with the production designer to achieve an overall tone of the film. In large productions, the costume designer will usually have one or more assistant costume designers. The costume supervisor works closely with the designer. In addition to helping with the design of the costumes, they manage the wardrobe workspace. They supervise construction or sourcing of garments, hiring and firing of support staff, budget, paperwork, and department logistics. Also called the wardrobe supervisor. This term is used less and less. The key costumer is employed on larger productions to manage the set costumers, and to handle the Star's wardrobe needs. The Costume standby is present on set at all times. It is his/her responsibility to monitor the quality and continuity of the actors and actresses costumes before and during takes. (S)he will also assist the actors and actresses with dressing. An Art finisher may be employed during the pre-production setup to "break down" garments. This specialized job includes making new clothing appear dirty, faded and worn. They are also known as breakdown artists. On large productions a buyer may be employed to source and purchase fabrics and garments. A buyer might also be referred to as a shopper. This distinction is often made when the lead actor in a production has control over their wardrobe, and they may personally hire this person. A costume technician who fits or tailors costumes, usually on-set. They can also be called cutters, seamstresses or tailors. Some celebrity actors have favorite cutters, and larger productions may hire several and have them on set at the same time, particularly in period film projects that might have complicated or extremely expensive extras wardrobe. The term cinematographer has been a point of contention for some time now. It is usually synonymous with "director of photography", though some professionals insist this only applies when the director of photography and camera operator are the same person. 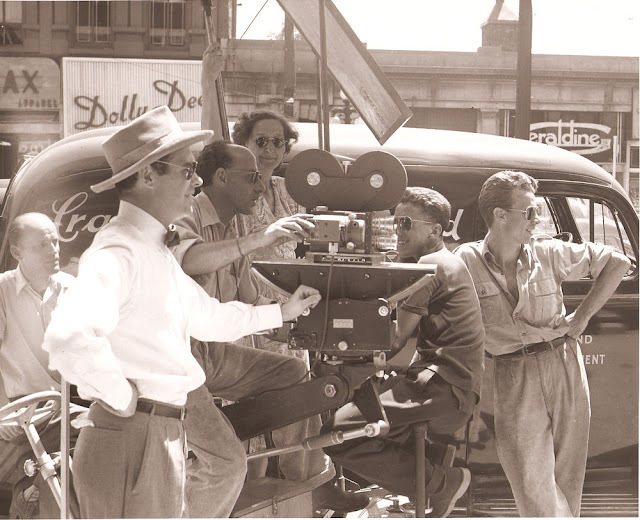 The director of photography is the chief of the camera and lighting crew of the film. The DoP makes decisions on lighting and framing of scenes in conjunction with the film's director. Typically, the director tells the DoP how they want a shot to look, and the DP chooses the correct aperture, filter, and lighting to achieve the desired effect as per the directors requirements. 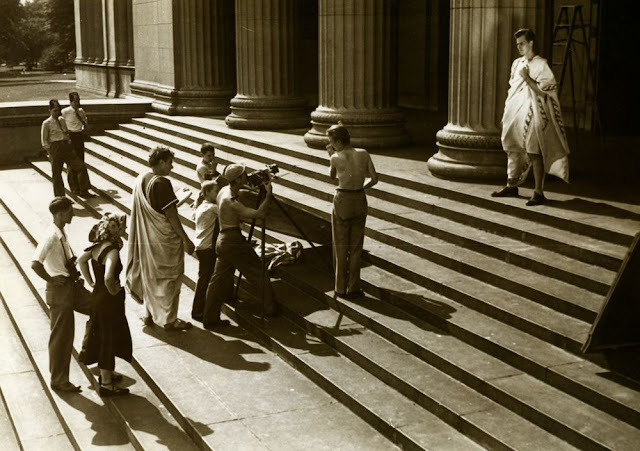 The camera operator uses the camera at the direction of the cinematographer, director of photography, or the film director to capture the scenes on film. Generally, a cinematographer or director of photography does not operate the camera, but sometimes these jobs may be combined. The first assistant camera (1st AC) is responsible for keeping the camera in focus as it is shooting. The second assistant camera (2nd AC) operates the clapperboard at the beginning of each take and loads the raw film stock into the camera magazines between takes, if there is no additional specifically designated film loader. The 2nd AC is also in charge of overseeing the meticulously kept notebooks that record when the film stock is received, used, and sent to the lab for processing. Additionally, the 2nd AC oversees organization of camera equipment and transport of the equipment from one shooting location to another. The loader is the designated film loader. They transfer motion picture film from the manufacturer's light-tight canisters to the camera magazines for attachment to the camera by the 2nd AC. After exposure during filming, the loader then removes the film from the magazines and places it back into the light-tight cans for transport to the laboratory. It is the responsibility of the loader to manage the inventory of film and communicate with the 1st AC on the film usage and remaining stock throughout the day. On small production crews, this job is often combined with the 2nd AC. With the prevalence of digital photography, this position is often eliminated. Usually a volunteer or trainee in the camera department, the camera PA assists the crew with menial details while learning the trade of the camera assistant, operator or cinematographer. On digital photography productions the digital imaging technician is responsible for the coordination of the internal workings of the digital camera. Under the direction of the cinematographer or director of photography, the DIT will make adjustments to the multitude of variables available in most professional digital cameras to creatively or technically manipulate the resulting image. A Steadicam operator is someone who is skilled at operating a Steadicam (trademark for a camera stabilization rig). This person is usually one of the camera operators on the production. This technician operates a motion control rig, which essentially is a 'camera robot' able to consistently repeat camera moves for special effects uses. Motion control rigs are typically rented with an experienced operator. The production sound mixer is head of the sound department on set, responsible for recording all sound during filming. This involves the choice and deployment of microphones, operation of a sound recording device, and sometimes the mixing of audio signals in real time. The boom operator is an assistant to the production sound mixer, responsible for microphone placement and movement during filming. The boom operator uses a boom pole, a long pole made of light aluminum or carbon fiber that allows precise positioning of the microphone above or below the actors, just out of the camera's frame. The boom operator may also place radio microphones and hidden set microphones. In France, the boom operator is called the perchman. The utility sound technician has a dynamic role in the sound department, most typically pulling cables, but often acting as an additional boom operator or mixer when required by complex filming circumstances. Not all films employ a utility sound technician, but the increasing complexities of location sound recording in modern film have made the job more prevalent. This role is sometimes credited as "cable man" or "python wrangler". Grips are trained lighting and rigging technicians. Their main responsibility is to work closely with the electrical department to put in lighting set-ups required for a shot. On the sound stage, they move and adjust major set pieces when something needs to be moved to get a camera into position. They may belong to the International Alliance of Theatrical Stage Employees. The key grip is the chief grip on a set, and is the head of the set operations department. The key grip works with the director of photography to help set up the set and to achieve correct lighting and blocking. The best boy grip is chief assistant to the key grip. They are also responsible for organizing the grip truck throughout the day. The grip in charge of operating the camera dollies and camera cranes is called the dolly grip. They place, level, and move the dolly track, then push and pull the dolly, and usually a camera operator and camera assistant as riders. The gaffer is the head of the electrical department, responsible for the design and execution of the lighting plan for a production. Sometimes the gaffer is credited as "Chief Lighting Technician". The best boy electric is the chief assistant to the gaffer. He or she is not usually on set, but dealing with the electric truck, rentals, manpower, and other logistics. Lighting technicians are involved with setting up and controlling lighting equipment. Does much of the actual research, footwork and photography to document location possibilities. Often the Location Manager will do some scouting himself, as well as the Assistant Location Manager. Hired by the Location Manager to be on-set before, during, and after the filming process. General responsibilities include arriving first at the location to allow the set dressers into the set for preparation; maintaining the cleanliness of the location areas during filming; fielding complaints from neighbors; and ultimately, at the end of the filming, making sure it seems as though the film crew was never there. There is generally one to three assistants on a shoot at any given time. This position exists generally on larger budget productions. The Locations PA is the assistant who is almost never onset, but instead is always "prepping" a location or "wrapping" a location. That is, when a location requires several days of set up and breakdown prior and following the day(s) of filming. A location production assistant is what a set production assistant is in Canada. The film editor is the person who assembles the various shots into a coherent film, with the help of the director. There are usually several assistant editors. With a photochemical process, the color timer adjusts the color of the film via printer lights for greater consistency in the film's colors. With a digital intermediate process, the colorist can use digital tools in manipulating the image and has greater creative freedom in changing the aesthetic of a film. The negative cutter cuts and splices the negatives as directed by the film editor, and then provide the assembled negative reels to the lab in order for prints (positives for projection) to be made. In post production, a telecine colorist is responsible for a "grade" - that is a look that has been created with a grading system, which adjusts brightness, contrast and color. The visual effects producer works with the visual effects supervisor to break down the script into storyboards, and advises the director as to how s/he should approach the scenes. Together they determine which sequences are to be shot as live action elements, which would work well in miniature, and which (if any) should be computer generated. VFX creative directors are very much like production designers, except they direct and supervise the creative side of the film's visual effects. The position is particularly in demand for films with massive amounts of computer generated imagery and scenes. The visual effects supervisor is in charge of the VFX crew, working with production and the film's director to achieve the desired in-camera optical effects of the film. The visual effects editor incorporates visual effects into the current cuts of live action sequences, producing multiple versions of each shot. Altered scenes are then evaluated by the visual effects supervisor and creative director for aesthetic and technical direction, and by the producers for review and final editing. A compositor is a visual effects artist responsible for compositing images from different sources such as video, film, computer generated 3-D imagery, 2-D animations, matte paintings, photographs, and text. These artists may rotoscope the footage, manually creating mattes for use in compositing. They may also paint visual information into or out of a scene, such removing wires and rigs, logos, dust busting, scratch removal, etc. These artists draw/paint entire sets or extend portions of an existing set. A system administrator, systems administrator, or sysadmin, is a person employed to maintain and operate a computer system and/or network. The sound designer, or "supervising sound editor", is in charge of the post-production sound of a movie. Sometimes this may involve great creative license, and other times it may simply mean working with the director and editor to balance the sound to their liking. Responsible for assembling and editing all the dialog in the soundtrack. Responsible for assembling and editing all the sound effects in the soundtrack. Balances all of the sounds prepared by the dialogue, music and effects editors, and finalizes the films audio track. The music supervisor, or "music director", works with the composer, mixers and editors to create and integrate the film's music. In Hollywood, a music supervisor's primary responsibility is to act as liaison between the film production and the recording industry, negotiating the use rights for all source music used in a film. The foley artist is the person who creates many of the sound effects for a film.